Most tanzanite gems are cut in oval or round shapes, you might come across some cushion or rectangular gems too. But a marquise shaped tanzanite gem is surely not common, this is precisely what gives the RG225 tanzanite and diamond ring an exclusive and stylish appeal. Shown as a tanzanite diamond ring in white gold, the RG225 is made to order in both gold and sterling silver. This ring showcases one of the rarest gems of all time, Tanzanite is believed to be at least 1,000 times rarer than diamond. A stretch of land in Tanzania that lies at the foothills of Mount Kilimanjaro, is the only space on earth where gem quality tanzanite is found. When you wear a gorgeous ring like this tanzanite diamond ring on your finger, it is a cause for celebration – a high end jewel that will serve you well for both formal and informal occasions. First found just a couple of decades ago (in 1967), tanzanite relied entirely on its beauty and rarity, to carve an important place for itself in the world of style and fashion. A tanzanite ring would have additional significance to you if, you happen to be born in the month of December. This gem was designated as one of the December birthstones in the year 2002. The single location existence of tanzanite along with its beauty, have been responsible for the increasing demand for tanzanite engagement and wedding rings. The same quality standards are maintained for the gold and silver tanzanite rings. We use natural tanzanite gemstones, all gems are custom cut by our gem artists. 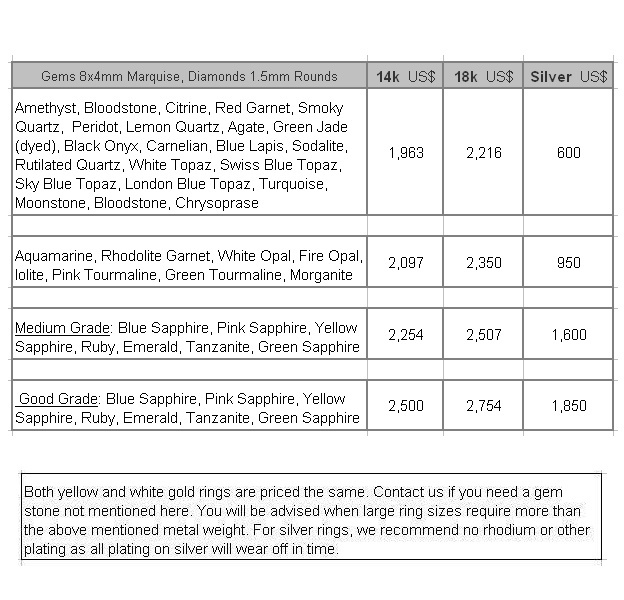 You can request for a gem authentication certificate for your tanzanite ring. The RG225 tanzanite gemstone and diamond ring is available in all ring sizes. This ring has an 8x4mm marquise tanzanite gem and 1.5mm round diamonds. The tanzanite white, yellow or pink gold ring is available in 14k and 18k gold. A good weight of 12 to 15 grams, makes the ring sturdy and long lasting. How To Buy: If you happen to be looking to purchase this tanzanite and diamond ring instantly by clicking some ‘Buy Now’ option, the news is that we have not implemented such rush buying functions on our websites. We will encourage you to discuss your requirements with our expert team at sales@kaisilver.com We evaluate our support team based on quality of advice provided, bringing sales orders is of secondary importance to us. You can ask as many questions as you wish to, no purchase commitment is required to get the benefit of their expertise. Once you have all the answers for your queries, you can move ahead to place the order and make a payment. While we accept Paypal and Western Union as modes of payment, we feel that Paypal is a better option for first time buyers. You can let us know which mode of payment you prefer and we will provide details for the same. Production And Shipping: Your custom made jewel will be completely custom made, and crafted by highly experienced artisans. A high degree of attention to even the smallest detail. The production time required is generally around 4 to 6 weeks from the date that payment is received. Exact time schedules will be clearly mentioned before you confirm the order with payment. We will ship through FEDEX with web tracking service. Kaisilver: With more than 7,000 quality conscious gem and jewelry lovers proudly wearing jewels crafted by us, we are the leading online source for high end custom made jewelry. Direct access to some of the world’s largest gem resources ensure that, we place no limitation on your choice of gemstones. You could pick a design from our website and order it in gold or silver with the gemstone of your choice. We can also work with your own design, you can send us an image or sketch of your dream jewel. Our team at sales@kaisilver.com will be glad to hear from you even if, you plan to make no purchase from us. Widely regarded as the best rendition of the 4 century old jewel, Kaisilver cladagh rings are crafted in gold or 925 silver. 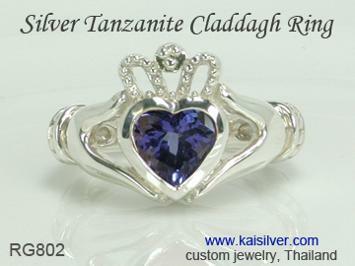 Shown here is a silver claddagh ring with tanzanite, you could choose the gem of your choice for your ring ... more. A sturdy men's 14k or 18k tanzanite gold ring, also available in sterling silver. 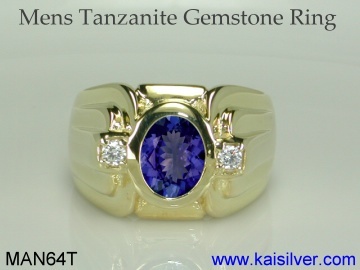 Review this and other tanzanite rings in the Kaisilver Tanzanite Ring Collection. We can custom make your tanzanite ring with your own design or ours ... more.